On Wednesday, Algerian-born Bernard-Henri Levi, 68, the self-appointed French philosopher, was hit with a pie while promoting his propaganda documentary Peshmerga which is about the Kurds fighting the US-Israel created ISIS. A Serb protester chanting Murderer, leave Belgrade hurled a pie at his face when he was presenting the film. Another protester climbed the stage with a banner bearing Jewish-communist hammer and sickle that read, Bernard Levy advocates imperialist murderers. As a typical humiliated Zionist whore, Levy equated Serbia with Syria – he shouted Long Live Democracy in French. It’s is the same idiot who never get tired calling Israel being the only democracy in the Middle East – a very disputed statement even by Jew scholars (here, here). Serbian nationalists see Levy as one of the main advocates of NATO bombing of Serbia in 1999 over Belgrade’s crackdown on Kosovan separatists. Serbian largest newspaper Kurir even claimed that Bernard Levy faked the incident to make Serbia look bad. “An identical incident occurred 23 years ago in Cannes, leaving doubt that Levy stages attacks just to make Serbs look bad,” the paper claimed. Being an Israeli agent in France, Levy must have learned such trick from Mossad. Levy is a close friend of former French presidents, Jacques Chirac, Francois Hollande and Nicolas Sarkozy. In November 2011, speaking at the first national Jewish convention in Paris, organized by the French Israel Lobby, the Council of Jewish Organization of France, Levy boasted that he lead the anti-Qaddafi campaign because it was a Jewish thing to do. “What I have done all these months, I did as a Jew. And like all the Jews of the world, I was worried. Despite legitimate anxiety is an uprising to be welcomed with favor, we were dealing with one of the worst enemy of Israel,” said Levy. In February 2017, Levi stated that if French communist party presidential candidate Jean-Luc Melenchon wins, he would leave France. Jean-Luc Melenchon is considered pro-Palestinian by the country’s organized Jewry. 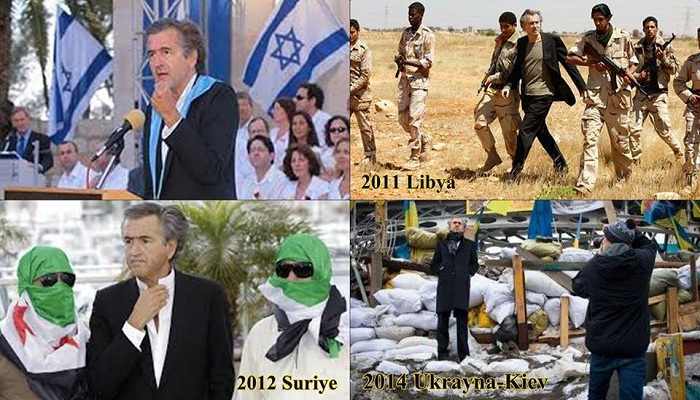 Bernard-Henry Levy, appeared on world-stage during his campaign for the release of Jewish film director Roman Polanski, who was arrested in Switzerland on September 26, 2009, for having unlawful sexual relationship with a 13-year-old girl in 1977. On July 4, 2011, Bernard Levy sponsored first Israeli conference on Syria in Paris. The conference was attended by Bernard Kouchner, former French Jew foreign minister and founder of Médecins Sans Frontières (Doctors Without Borders), Frederik Ansel, a member of Israel’s ruling Likud Party, Alex Goldfarb, former Knesset member and adviser to Israeli defense minister Ehud Barak and Andre Glucksmann, an Islamophobe French writer (here). Bernard Levy had spewed his anti-Muslim propaganda from Bosnia to Bangladesh. In 2002, French president Chirac sent Levy to Afghanistan on an official mission to find out what Afghans expect from Paris to defeat Taliban. During his visit, Levy set-up Radio Free Kabul. Levi is author of several books including Qui a tue Daniel Pearl, in which he whines about Mossad spy Daniel Pearl who was killed in 2002 while snooping around as WSJ journalist in Karachi. In 1971, Bernard Levy pleaded with French president Georges Pompidou to help Indian invasion of East Pakistan in order to establish a separate homeland for Bengali people.